Back in stock and with a fresh new look: our popular booklet, For Your Protection: Peace Bonds and Family Law Protection Orders, has been completely redesigned as well as updated. For Your Protection explains how and when people can apply for peace bonds and family law protection orders, and what the differences are between them. This revised version will be available later this year in Farsi, Chinese (simplified and traditional), and Punjabi. Back in stock! We’ve revised Sponsorship Breakdown to reflect changes to immigration law — most importantly, the elimination of conditional permanent resident status. We’ve also updated the chapter about applying for welfare and the section listing community groups and other help. 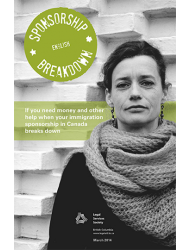 Sponsorship Breakdown is for permanent residents who need money and other help when the person sponsoring them in Canada stops supporting them. LSS is committed to providing PLEI publications in our second language for our francophone community here in BC and for all French-speaking newcomers to BC. We’ve just released three new or revised French translations, available online only. We’ve revised and updated our popular, award-winning booklet. Previous versions are no longer accurate and should be discarded. All these translations are available, online-only, on the MyLawBC website. You can also find a full list of all our French PLEI publications. Thank you to the Francophone Affairs Program in BC for funding these translations, made possible through the Canada–British Columbia Official Languages Agreement on French-Language Services. Sometimes we look through old posts and find ones so interesting we want to share them again. This is one of them. It originally ran in ELAN on Oct 21, 2013. Every fall we hold our Provincial Advocates Conference, which trains advocates from all around the province on legal issues. Day one of the training was just for our community partners and I had a chance spend the day with them. Community partners are organizations across BC – in 24 communities right now [Ed. Note: we’re up to 26 now] – that work with people who may need legal aid. As part of their day-to-day jobs, they deal with people who need legal aid or who could use our resources, so we make sure that they are trained, up-to-date, and ready to point those people in our direction. Part of the day was spent updating all of these advocates on legal aid services and resources: updates to our websites, new publications, ways of sharing information, and more. By request, the rest of the day was spent on a really interesting, and kind of scary, presentation by BC Society of Transition Houses’ Safety Net Canada Project on the (mis)use of technology and violence against women. Many of our community partners’ work often supports women and their children leaving abusive relationships and in recent years technology has been used more and more for harassment and stalking. I deal with technology and the online world all the time. In fact it’s most of what I do at LSS. But some of the stuff that was brought up in that presentation absolutely floored me. I mean, I know that digital photos can contain location data about where they were taken, or that spyware can record what you type, or that you can disguise your phone number as someone else’s, but the implications of what that could mean for someone fleeing an abusive relationship never really crossed my mind. Some of it never even occurred to me; for example, I hate email forms – those text boxes that some sites make you fill out rather than just giving you an email address – but someone brought up that using them means that email addresses, say for a women’s shelter, don’t get stored in the address book or your email isn’t sitting in the sent folder. Two very real issues if someone is trying to track your online communications. A change in law means that a section of our booklet Sponsorship Breakdown is no longer accurate. Conditional permanent resident status no longer exists (the Canadian government ended this condition recently). If someone is a permanent resident, immigration officials won’t ask them to leave Canada if they separate from their spouse, unless they believe the marriage wasn’t genuine. The information in our booklet about conditional permanent resident status is no longer accurate and can be ignored. We’re in the process of updating the booklets in English and all other languages, but that process will take some time. In the interim, we will continue to distribute the existing edition, with an alert on the order page. If you’re a community worker and have existing copies in your office, please inform anyone you give a copy to about this change. If you have any questions or comments feel free to send them to publications@lss.bc.ca. Order the new print version of Live Safe, End Abuse or read the combined version online. Translations are coming later this year. Most of the original fact sheets are still available in simplified and traditional Chinese, Farsi, French, Punjabi, and Spanish, in print and online. Live Safe, End Abuse replaces our booklet Surviving Relationship Violence and Abuse, which has been discontinued. You can now order the print version of Mothers Leaving Abusive Partners and also read it online. With the help of a network of people, Maya realizes that she is not alone and feels empowered to start a new life with her children free from abuse. Leaving Abuse tells Maya’s story through striking illustrations and basic legal information written in plain language to put a human face on the help that is available for women leaving abusive partners. Leaving Abuse is available online and in print. Co-produced with the Healthy Aboriginal Network (HAN), Clear Skies is an innovative new approach to teaching the public about the law. This comic book uses an engaging story and striking imagery to tell the story of Marnie and her kids, who live with family violence. With the support of her community, and by learning her legal options, Marnie is able to leave an abusive relationship. Clear Skies speaks to Aboriginal youth and brings a human face to the legal process. During the development stage, Aboriginal youth asked LSS and HAN to create a video version of the comic book. View the video on the Clear Skies page on the Aboriginal Legal Aid in BC website. This webpage also lists resources and contacts to help people experiencing family violence. Clear Skies is available online and in print. Safety in Same-Gender Relationshipsand Safety in Relationships for Trans* FolkWe’ve co-produced these two new resources for members of the LGBTQ and trans* communities with QMUNITY. community organizations where help is available. Both booklets are available online and in print. It includes where to find legal help for criminal court and family court cases.